This research and development was undertaken with the financial support of the Canadian Space Agency. Ridges on large lakes exceed 50 km in length and often are more than 2 m high. NextGen can detect and map ridges from space. Pressure ridges are ice deformations that include troughs on either side. The ridge and troughs are relatively weak ice and decay early to form a lead. Ridges flood snow with lake water during uplift - winter period. Pressure ridge collapse of sails- immersion hazard. After overnight freezing and new snow these areas appear to be good crossing sites, but are not. Trough deformation adjacent to ridge and uplift as ice expands. Water-filled troughs freeze with thin ice at night. April 5, 2018 - open water along ridge axis. Fixed wing drone data collected during Intermittent Melt Period. April 11, 2018 - Ice sheet moves 1.6 m and closes crack along ridge. Fixed wing drone data collected during Diurnal Melt Period. April 22, 2018 - active collapse and decay stage - fixed wing drone data collected during Diurnal Melt Period. April 28, 2018 - ridge mostly collapsed and sails floating. Fixed wing drone data collected during Accelerated Melt Period. May 5, 2018 - Ridge sails afloat along ridge axis after collapse and lead size increases. Accelerated Melt Period 2 days before break-up. Rubble ice accumulates during freeze up - paths through or around rubble fields can be extracted from RADAR data. "Push ice" or "shove ice" encroaches on shorelines and can result in property damage. NextGen can detect this change from space. Lake Ice is a dynamic and well-known travel hazard but remains poorly studied. NextGen uses climate information, RADAR satellite data, classification and change detection methods to identify, map, and monitor lake ice hazards. Frozen lakes are common features of our landscape and are an important cultural heritage. It is unfortunate that most people have to learn lake ice safety on their own, step by step, by trial and error. That is the inherent nature of risk. NextGen advocates new technology and education can help to decrease risk by improving the safety of lake ice travel through planning, identification, and monitoring of risk factors. Our services complement your existing best practices for travel on floating lake ice and may extend and improve them. Why Map Lake Ice Hazards Now? Our past experience on lake ice is not expected to be a good indicator of the future. This challenges even the experienced as we all head into a new ice regime. A study published recently in Nature Climate Change indicates an extensive loss of lake ice will occur within the next generation. This is not the distant future. Such climate change could have profound effects on many remote communities and the recreational activities of an increasing number of lake ice users as our populations grow. Inter-annual climate variation is superimposed on this warming trend. This means the risks we understand today are likely to increase as the ice conditions that we have become accustomed to change. A new approach is merited to help ease into a warming climate. NextGen’s experience can help. The risk of collision with rough ice or immersion of property and people can be reduced with planning, identification, and monitoring of specific risk factors that improve best practices for travel on lake ice. Also, there is information about the structure and decay of lake ice held within the scientific community that should be more accessible to those of benefit. Such outreach has not occurred before as it was not possible to create and relay timely and actionable information. The maturation of RADAR satellite imaging and internet technologies today means we can detect properties of lake ice from space and make this information available in near-real time applications using the web and cellular phones. RADAR images are formed with energy that comes from the satellite. This means imaging can occur at night, through clouds during the day, and using wavelengths that are independent of weather. As the number of RADAR satellites is increasing and with low or no cost for images new and meaningful applications are real. The pressure ridge in the distance will start to collapse and expose open water long before the competency of the horizontal ice is compromised. A map of ridges derived from satellite aids winter navigation and helps avoid immersion in the ridge axis in the spring. Surface signs of vertical draining indicating the structure of the ice is changing. March 26, 2018. An ice core taken on the southern basin of Lake Winnipeg, March 27, 2018 after several days of melting. Vertical channels are evident in the core when back-lit from the sun. 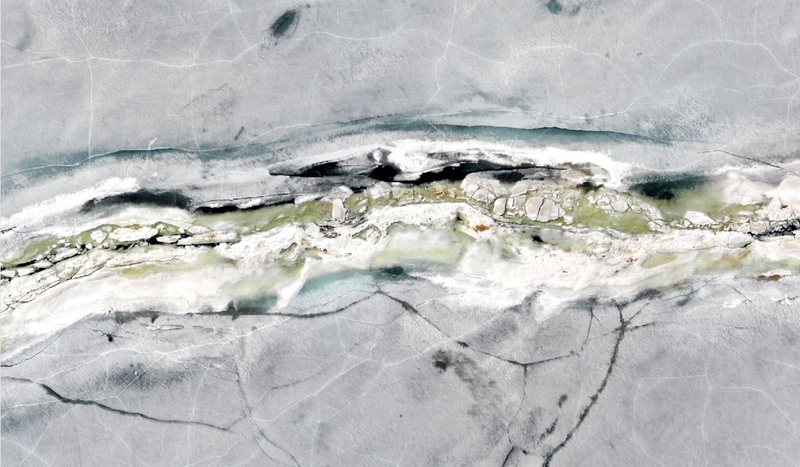 March 31, 2019 – NextGen completed a study of lake ice hazards funded by the Canadian Space Agency. We studied 84 lakes in Canada for two winters (three consecutive freeze-ups) to break-up, starting in 2016. Ice validation study was completed in smaller areas of the complex ice cover found on the south basin of Lake Winnipeg. After the novel and successful project, NextGen continues to develop the technology and refined it. We have since refined and applied the new advances in understanding to the challenging ice conditions found at the scale of the southern basin of Lake Winnipeg for the 2018/2019 ice cover period. Please see our April 2019 newsletter for more information on our Lake Ice Hazard Advisory Service. We welcome your interest and look forward to working with you. Call 1-204-298-0551. Distribution of lake ice, rubble fields, and pressure ridges from November 24, 2018 to March 12, 2019 (highly decimated!) in the southern basin of Lake Winnipeg. Dates indicate the first imaging of the emerging ridges. As of March 12, the length of pressure ridges present was 523.9 km. ©2017 NexGen Environmental Research Inc. All rights reserved.